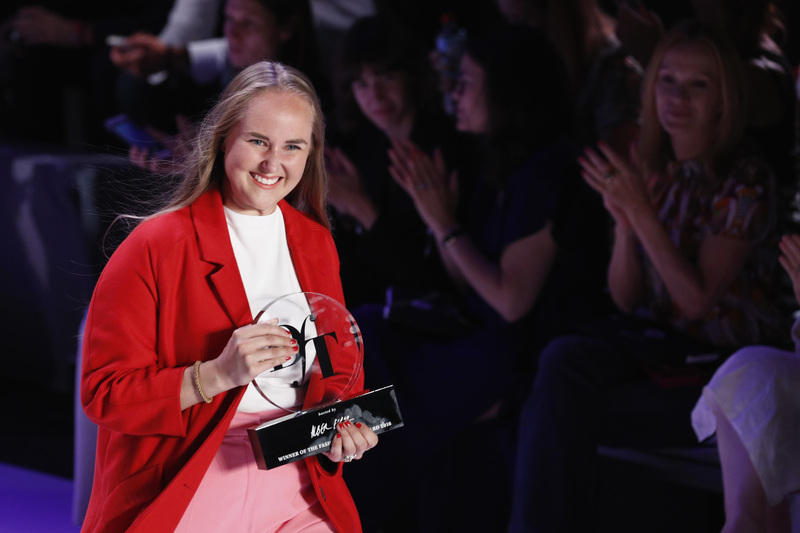 Edda Gimnes is the winner of the 2016 fashion talent award “Designer for Tomorrow” by Peek & Cloppenburg and its online shop Fashion ID. 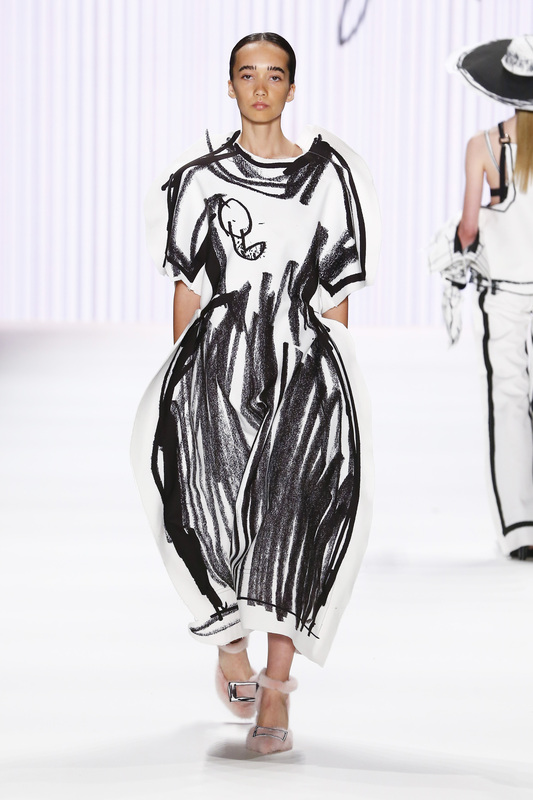 The graduate from the London College of Fashion presented her womenswear collection “The Ragpicker” this evening on the catwalk at Mercedes-Benz Fashion Week Berlin and won over the Jury Board led by Patron Alber Elbaz with her hand-drawn prints in black and white. The award show kicked off with the new collection by Mareike Massing, the 2015 DfT winner. The 700 guests included Naomie Harris, Sofía Sanchez de Betak, Emilia Schüle, Sara Nuru, Franz Dinda, Ursula Karven, Franziska Knuppe, Katja Flint, Johanna Klum, who was hosting, and Lena Meyer-Landrut, who performed two songs live at the beginning of the evening. “I was very impressed by the individuality and creativity of all the collections,” Alber Elbaz said in a video message from Paris. At the last minute the Patron of this year’s “Designer for Tomorrow” award had to cancel his appearance at the show. He is currently recovering from pneumonia, which prevented him from traveling to Berlin. The Patron watched the live stream of the award show that was held in the tent at Mercedes-Benz Fashion Week Berlin and, together with the Jury Board, selected the “Designer for Tomorrow 2016”. Alber Elbaz was represented at the show by his long-time companion and muse Sofía Sanchez de Betak, who is well-known in the fashion industry as an art director, fashion consultant and model. 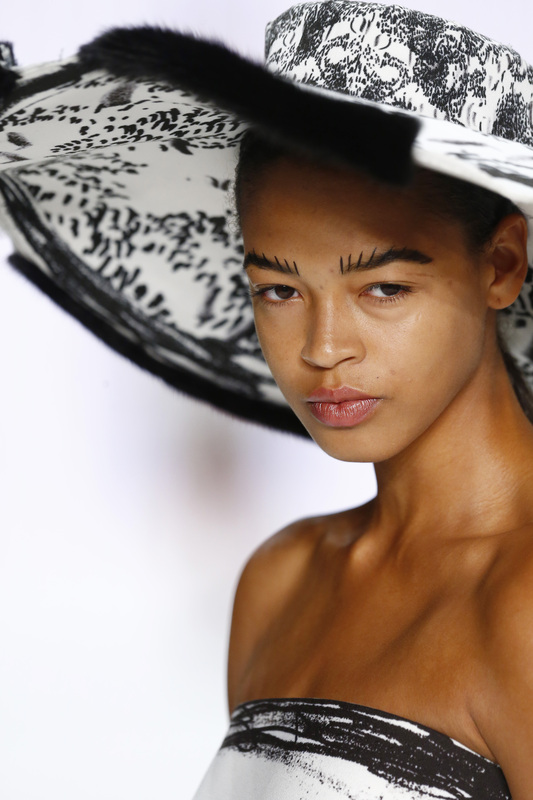 Alber Elbaz said of the winner: “I especially see a lot of potential in the collection by Edda Gimnes. She captured my imagination and I’m keen to find out how her talent will evolve.” The right-handed Edda Gimnes created instinctive drawings with her left hand, inspired by her own eclectic assortment of found objects. The resulting fantasy world was then brought to life in black and white using canvas and fur. 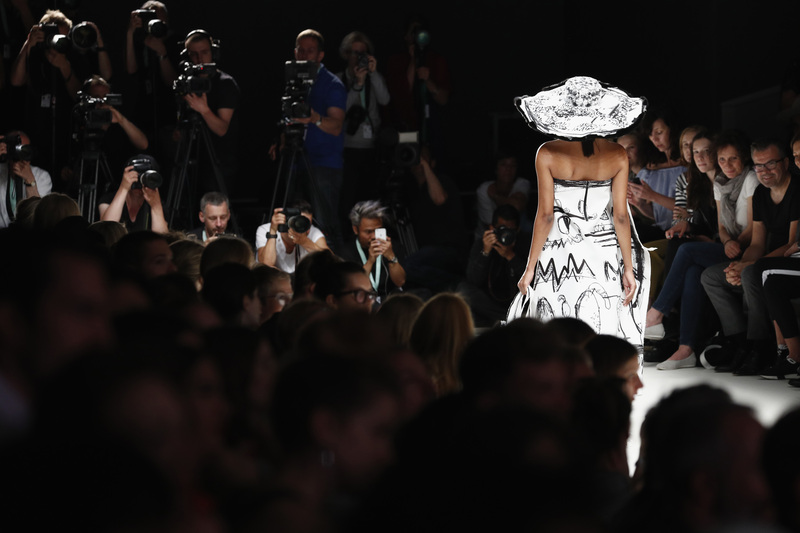 The next step for the up-and-coming designer: a trip to Paris to visit Alber Elbaz as part of the one-year sponsorship program. 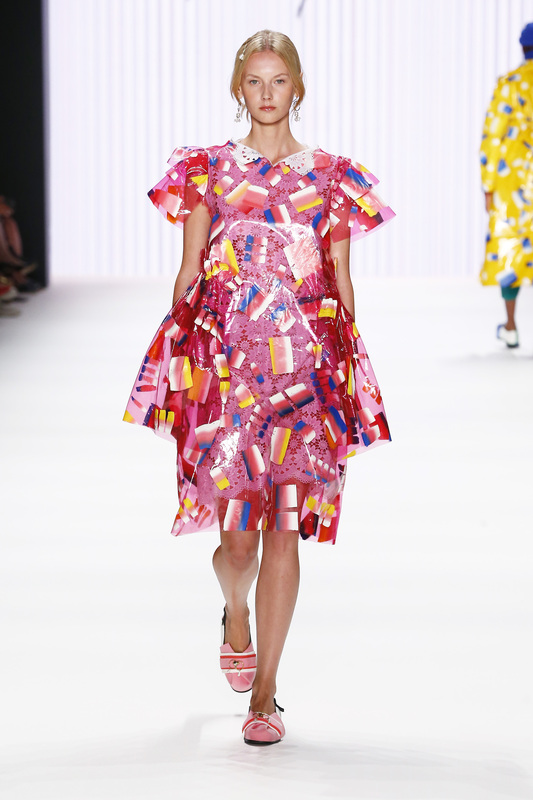 Edda Gimnes follows in the footsteps of Mareike Massing, who was voted “Designer for Tomorrow” last year. Since then Mareike has gained extensive industry experience – not least as a result of her inspirational trip to New York and internship at Jake*s Collection in Düsseldorf, where she worked alongside the creative team to come up with her own “Capsule Collection”. This evening marked the grand finale of her sponsorship program, as Mareike presented her new “No. 1” collection which was inspired by the art nouveau furniture of Carlo Bugatti. The collection emphasizes the feminine form and the contrast between fixed and flowing fabrics, uniting the rigidity of furniture with the dynamic movements of the body in motion. “For me, DfT has been a very enriching experience and I have gained many valuable contacts for the next stage in my career,” said Mareike, reflecting on the past year. Christiane Arp (Editor-in-Chief VOGUE), John Cloppenburg (Member of the Executive Committee Peek & Cloppenburg KG, Düsseldorf), Melissa Drier (German Correspondent Women’s Wear Daily), Karen Heumann (Founder and Chairwoman (Spokesperson) thjnk), Marcus Luft (Deputy Editor-in-Chief and Fashion Director GALA), Jessica Weiß (Founder and chief writer on the Journelles.de fashion blog), Kerstin Weng (Editor-in-Chief InStyle), Michael Werner (Editor-in-Chief TextilWirtschaft). The fashion talent award “Designer for Tomorrow” has been presented as part of Mercedes-Benz Fashion Week Berlin since 2009. As an initiative of Peek & Cloppenburg and its online shop Fashion ID, the award provides a visible platform for creativity. It offers up-and-coming fashion talent the opportunity to be discovered as such and to receive a great deal of attention from the fashion industry and the public. Edda Gimnes (London College of Fashion), David Kälble (Academy of Fashion & Design Düsseldorf (AMD)), Elisa Kley (University of Applied Sciences and Arts Hannover), Marc Morris Mok (London College of Fashion), and Ancuta Sarca (University of Art and Design Cluj-Napoca).